A value chain is a set of activities that a firm operating in a specific industry performs in order to deliver a valuable product or service for the market. The concept comes through business management and was first described by Michael Porter in his 1985 best-seller, Competitive Advantage: Creating and Sustaining Superior Performance. The idea of the value chain is based on the process view of organizations, the idea of seeing a manufacturing (or service) organization as a system, made up of subsystems each with inputs, transformation processes and outputs. Inputs, transformation processes, and outputs involve the acquisition and consumption of resources – money, labour, materials, equipment, buildings, land, administration and management. How value chain activities are carried out determines costs and affects profits. The concept of value chains as decision support tools, was added onto the competitive strategies paradigm developed by Porter as early as 1979. [dubious – discuss] In Porter's value chains, Inbound Logistics, Operations, Outbound Logistics, Marketing and Sales, and Service are categorized as primary activities. Secondary activities include Procurement, Human Resource management, Technological Development and Infrastructure (Porter 1985, pp. 11–15). According to the OECD Secretary-General (Gurría 2012) the emergence of global value chains (GVCs) in the late 1990s provided a catalyst for accelerated change in the landscape of international investment and trade, with major, far-reaching consequences on governments as well as enterprises (Gurría 2012). The appropriate level for constructing a value chain is the business unit, not division or corporate level. Products pass through a chain of activities in order, and at each activity the product gains some value. The chain of activities gives the products more added value than the sum of added values of all activities. The activity of a diamond cutter can illustrate the difference between cost and the value chain. The cutting activity may have a low cost, but the activity adds much of the value to the end product, since a rough diamond is significantly less valuable than a cut diamond. Typically, the described value chain and the documentation of processes, assessment and auditing of adherence to the process routines are at the core of the quality certification of the business, e.g. ISO 9001. 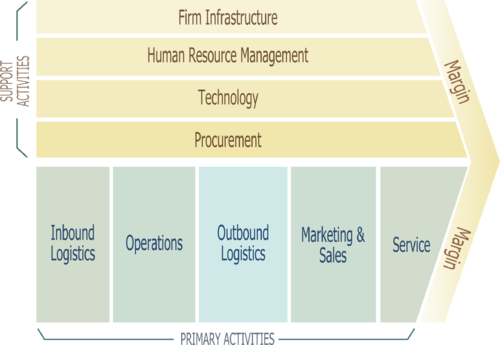 A firm's value chain forms a part of a larger stream of activities, which Porter calls a value system. A value system, or an industry value chain, includes the suppliers that provide the inputs necessary to the firm along with their value chains. After the firm creates products, these products pass through the value chains of distributors (which also have their own value chains), all the way to the customers. All parts of these chains are included in the value system. To achieve and sustain a competitive advantage, and to support that advantage with information technologies, a firm must understand every component of this value system. Operations: concerned with managing the process that converts inputs (in the forms of raw materials, labor, and energy) into outputs (in the form of goods and/or services). Companies can harness a competitive advantage at any one of the five activities in the value chain. For example, by creating outbound logistics that are highly efficient or by reducing a company's shipping costs, it allows to either realize more profits or pass the savings to the consumer by way of lower prices. Using support activities helps make primary activities more effective. Increasing the any of four support activities helps at least one primary activity to work more efficient. Infrastructure: consists of activities such as accounting, legal, finance, control, public relations, quality assurance and general (strategic) management. Procurement: the acquisition of goods, services or works from an outside external source. In this field company also makes decisions of purchases. Competitive advantage cannot be understood by looking at a firm as a whole. It stems from the many discrete activities a firm performs in designing, producing, marketing, delivering and supporting its product. Each of these activities can contribute to a firm's relative cost position and create a basis for differentiation. The value chain categorizes the generic value-adding activities of an organization. The activities considered under this product/service enhancement process can be broadly categorized under two major activity-sets. Physical/traditional value chain: a physical-world activity performed in order to enhance a product or a service. Such activities evolved over time by the experience people gained from their business conduct. As the will to earn higher profit drives any business, professionals (trained/untrained) practice these to achieve their goal. Virtual value chain: The advent of computer-based business-aided systems in the modern world has led to a completely new horizon of market space in modern business-jargon – the cyber-market space. Like any other field of computer application, here also we have tried to implement our physical world's practices to improve this digital world. All activities of persistent physical world's physical value-chain enhancement process, which we implement in the cyber-market, are in general terms referred to[by whom?] as a virtual value chain. In practice as of 2013[update], no progressive organisation can afford to remain stuck to any one of these value chains. In order to cover both market spaces (physical world and cyber world), organisations need to deploy their very best practices in both of these spaces to churn out the most informative data, which can further be used to improve the ongoing products/services or to develop some new product/service. Hence organisations today try to employ the combined value chain. Combined Value Chain = Physical Value shown in sample below. This value-chain matrix suggests that there are a number of opportunities for improvement in any business process. An industry value-chain is a physical representation of the various processes involved in producing goods (and services), starting with raw materials and ending with the delivered product (also known as the supply chain). It is based on the notion of value-added at the link (read: stage of production) level. The sum total of link-level value-added yields total value. The French Physiocrats' Tableau économique is one of the earliest examples of a value chain. Wasilly Leontief's Input-Output tables, published in the 1950s, provide estimates of the relative importance of each individual link in industry-level value-chains for the U.S. economy. In an (industrial) development context, the concepts of global value chain analysis were first introduced in the 1990s (Gereffi et al.) and have gradually been integrated into development policy by the World Bank, Unctad, the OECD and others. Value chain analysis has also been employed in the development sector as a means of identifying poverty reduction strategies by upgrading along the value chain. Although commonly associated with export-oriented trade, development practitioners have begun to highlight the importance of developing national and intra-regional chains in addition to international ones. For example, the International Crops Research Institute for the Semi-Arid Tropics (ICRISAT) has investigated strengthening the value chain for sweet sorghum as a biofuel crop in India. Its aim in doing so was to provide a sustainable means of making ethanol that would increase the incomes of the rural poor, without sacrificing food and fodder security, while protecting the environment. The value chain framework quickly made its way to the forefront of management thought as a powerful analysis tool for strategic planning. The simpler concept of value stream mapping, a cross-functional process which was developed over the next decade, had some success in the early 1990s. The value-chain concept has been extended beyond individual firms. It can apply to whole supply chains and distribution networks. The delivery of a mix of products and services to the end customer will mobilize different economic factors, each managing its own value chain. The industry wide synchronized interactions of those local value chains create an extended value chain, sometimes global in extent. Porter terms this larger interconnected system of value chains the "value system". A value system includes the value chains of a firm's supplier (and their suppliers all the way back), the firm itself, the firm distribution channels, and the firm's buyers (and presumably extended to the buyers of their products, and so on). Capturing the value generated along the chain is the new approach taken by many management strategists. For example, a manufacturer might require its parts suppliers to be located nearby its assembly plant to minimize the cost of transportation. By exploiting the upstream and downstream information flowing along the value chain, the firms may try to bypass the intermediaries creating new business models, or in other ways create improvements in its value system. Value chain analysis has also been successfully used in large petrochemical plant maintenance organizations to show how work selection, work planning, work scheduling and finally work execution can (when considered as elements of chains) help drive lean approaches to maintenance. The Maintenance Value Chain approach is particularly successful when used as a tool for helping change management as it is seen as more user-friendly than other business process tools. A value chain approach could also offer a meaningful alternative to evaluate private or public companies when there is a lack of publicly known data from direct competition, where the subject company is compared with, for example, a known downstream industry to have a good feel of its value by building useful correlations with its downstream companies. Moreover, it can offer an insight in how e-commerce and m-commerce (mobile commerce) add value in the flow of activities and proccesses involved in business-to-consumer markets. Once value has been analysed and the contributing parts of the organisation have been identified, other models can be used in conjunction with the value chain to assess how these areas can either be improved or capitalised upon. For example, a SWOT analysis can be used within the "outbound logistics" function to understand what its strengths and weaknesses are, and what opportunities there may be to improve that area, or identify the threats to what may be a critical part of the value delivery system. Equally, other models can be used to assess performance, risk, market potential, environmental waste, etc. The Supply-Chain Council, a global trade consortium in operation with over 700 member companies, governmental, academic, and consulting groups participating in the last 10 years, manages the Supply-Chain Operations Reference (SCOR), the de facto universal reference model for Supply Chain including Planning, Procurement, Manufacturing, Order Management, Logistics, Returns, and Retail; Product and Service Design including Design Planning, Research, Prototyping, Integration, Launch and Revision, and Sales including CRM, Service Support, Sales, and Contract Management which are congruent to the Porter framework. The SCOR framework has been adopted by hundreds of companies as well as national entities as a standard for business excellence, and the U.S. Department of Defense has adopted the newly launched Design-Chain Operations Reference (DCOR) framework for product design as a standard to use for managing their development processes. In addition to process elements, these reference frameworks also maintain a vast database of standard process metrics aligned to the Porter model, as well as a large and constantly researched database of prescriptive universal best practices for process execution. ^ a b Porter, Michael E. (1985). Competitive Advantage: Creating and Sustaining Superior Performance. New York. : Simon and Schuster. Retrieved 9 September 2013. ^ a b "Decision Support Tools: Porter's Value Chain". Cambridge University: Institute for Manufacturing (IfM). Archived from the original on 29 October 2013. Retrieved 9 September 2013. ^ Porter, Michael E. (1979). "How competitive forces shape strategy" (PDF). Harvard Business Review. Archived from the original (PDF) on 29 October 2013. Retrieved 9 September 2013. ^ a b c d Angel Gurría (5 November 2012). The Emergence of Global Value Chains: What Do They Mean for Business. G20 Trade and Investment Promotion Summit. Mexico City: OECD. Retrieved 7 September 2013. ^ Kenton, Will. "Value Chain". Investopedia. Retrieved 2019-02-20. ^ Ghemawat, Pankaj (Spring 2002). "Competition and Business Strategy in Historical Perspective". Business History Review. Harvard Business Review. SSRN 264528. ^ Pierre LeBlanc; Stephen Matthews; Kirsti Mellbye (4 September 2013). The Tax Policy Landscape Five Years after the Crisis (Report). OECD Taxation Working Papers. France: OECD. Archived from the original on 18 March 2014. Retrieved 7 September 2013. ^ Gereffi, G., (1994). The Organisation of Buyer-Driven Global Commodity Chains: How US Retailers Shape Overseas Production Networks. In G. Gereffi, and M. Korzeniewicz (Eds), Commodity Chains and Global Capitalism. Westport, CT: Praeger. ^ Jonathan Mitchell; Christopher Coles & Jodie Keane (December 2009). "Upgrading Along Value Chains: Strategies for Poverty Reduction in Latin America" (PDF). Comercio y Pobreza en Latino América (COPLA). Briefing Paper. London: Overseas Development Institute. ^ Microlinks (2009) [Value Chain Development Wiki https://www.marketlinks.org/using-value-chain-development-wiki] Washington, D.C.: USAID. ^ Martin, James (1995). The Great Transition: Using the Seven Disciplines of Enterprise Engineering. New York: AMACOM. ISBN 978-0-8144-0315-0. , particularly the Con Edison example. ^ "The Horizontal Corporation". Business Week. 1993-12-20. ^ Barnes, Stuart J. (2001-12-28). "The mobile commerce value chain: analysis and future developments". www.sciencedirect.com. Retrieved 2019-03-28. This page was last edited on 29 March 2019, at 10:23 (UTC).